In the New World the art of metalworking first began in South America, where there are rich deposits of gold, silver, and copper. One of the earliest pieces of hammered gold found in the Peruvian highlands dates from 1500 B.C. Because of its rarity and associations with the sun, gold was reserved for nobility. 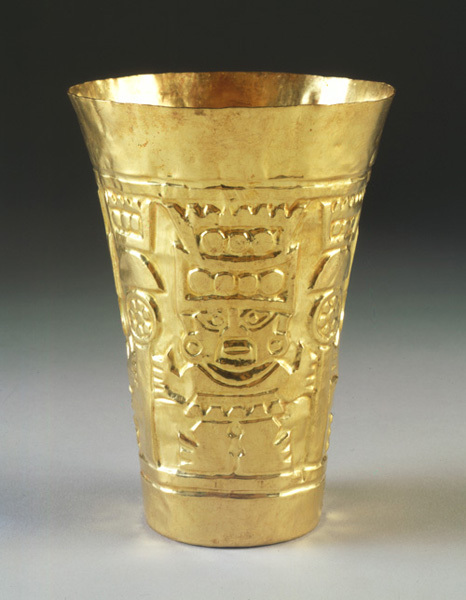 The Sicán, who established cities along the northern coast of Peru in the late eighth century, buried their elite with large quantities of precious objects, including gold death masks and nested beakers. This cup was created from a single sheet of hammered gold, a favorite technique of the craftsmen of the region. Its central figure, the Lord of Sicán, is an ancient Andean icon associated with the sky deity. Here he is represented as a warrior and carries a spear in each hand.